Click Here to Meet the Faculty. The Visual Arts program at MMA enables our students to find their creative voice and express their dreams, stories, and view of the world through use of visual media. The study of art also enhances self-esteem, cognition, and critical thinking. Many art processes, techniques, forms and art tools are implemented across the program. Everything from creating with pencil, charcoal, watercolor, and pastels to working with clay in sculpting, to 2D, 3D, and graphic design, printmaking, computer graphics, and more is experienced within the Art Department curriculum. An art major is offered in sophomore year. Art graduates garner important skills that will last their entire lives; they will be able to create, produce, and present their art while making connections- both interpersonal and abstract. The prerequisite for an art major is the presentation of six recent pieces of art, an essay and interview with the art department head. The National Art Honor society is based on the principles of Art Scholarship, Character, and Service. All students are invited to NAHS with the understanding that members use their creative talents in service of others. 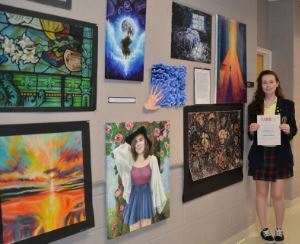 Students qualify to be registered with the National Art Education Association and to be inducted each May at Merion after providing at least 15 hours of art-related service to those in need. We are so serious about the study of art that a new art and design center recently opened as part of the Upward & Onward Campaign. The inspiring art studios are equipped with everything needed for all forms of art instruction–fine art to digital design. The space also includes a student exhibit gallery. "The new art studios will further ignite our passion for art!"